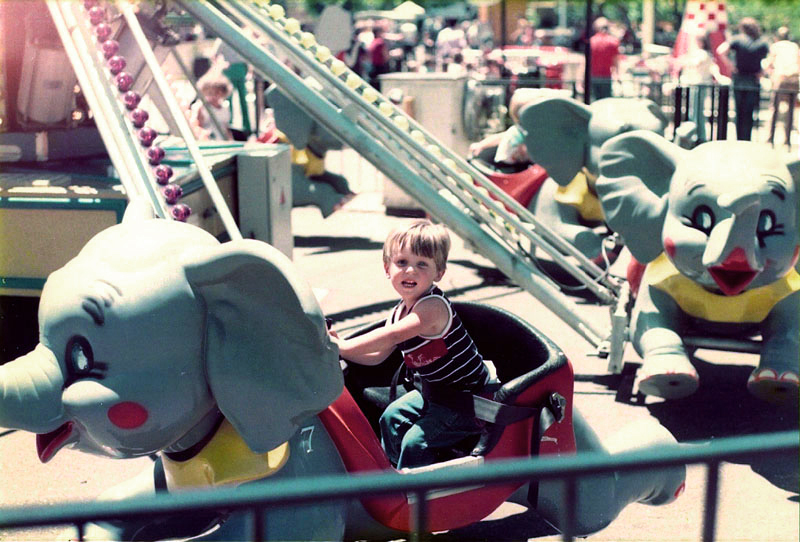 Based on Disneyland’s popular Dumbo ride, Flying Elephants was a version manufactured in Italy.¹ Lagoon’s model was placed south of Kiddie Coaster in 1982. It was one of many spinning kids’ rides at the park, but it was the first new kiddie ride since the Scamper bumper cars arrived in 1977. It was also the first in a succession of new kiddie rides that hadn’t been seen since the 1960s. As Mother Gooseland transitioned to Kiddie Land, a new ride was introduced every season from 1982 to 1986. Moonraker landed in 1983, followed by Red Baron in 1984 and Puff The Little Fire Dragon in 1985. In 1986, the Flying Elephants were replaced by Scaliwags, an almost identical ride with a variety of animals, including a flying elephant. 1. One example of this ride has been operating at Kennywood since 1987 where it’s called Elephant Parade. Barbieri eventually sold rights to this and other ride models to Zamperla, also of Italy. Mini Jet. Zamperla Rides, accessed 14 Jan 2016. Kiddie Rides. Kennywood Connection, accessed 17 Mar 2019.